Kaeth Gard was at that time the project manager of Hembakningsrådet, an association of yeast, flour, margarine and sugar manufacturers, who are now ruled by Dansukker. The holiday was introduced to draw attention to an old traditions, existing in Sweden and cinnamon buns were given a special focus. Another aim of the holiday was to increase the consumption of yeast, flour, butter and sugar. Cinnamon Roll Day is observed in restaurants and shops by numerous advertisements, that encourage visitors to order or buy a cinnamon buns. 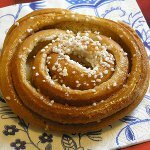 Kaeth Gard established Cinnamon Roll Day on October 4 in order to avoid the competion with other culinary traditions in Sweden, like crayfish, rolls, herring. Originally October 4, 1999 observed International Children's Day, and a cinnamon bun would be a symbol of caring for children.